How has the real estate market been in Fairfax County over the past few months? 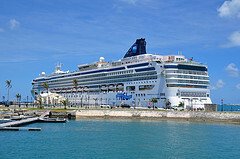 Some of us, Northern Virginia Realtors®, saw good activity in the late Winter (when it’s normally nice and quiet and a great time to go on a cruise vacation… hey, it’s ok to dream!). Many of us thought that this Spring would bring so much work that we’d have to quit sleeping for several months. So we braced ourselves in exited anticipation for a wonderful, active Spring. But Winter lingered (and it lingered so much that I thought that I had been transported to Canada in my sleep) and the Spring market took quite a while to thaw out. Finally, we saw some healthy activity toward May and June, which then promptly quieted down again for the usual Summer break. In accordance to the usual yearly market cycle, we saw a peak of activity during August. Based on the usual market cycle, we should see a good buying opportunity from now and into October, and the best home deals of the year coming up in November and December. That’s the usual yearly market cycle, but how is the market compared to last year? How’s the Fairfax County real estate market compared to last year? Compared to last year, the market in Fairfax County has seen home prices increase (year-to-date) by about 1% – just as I predicted back in January. For example, the City of Falls Church has increased about 10% its prices year-to-date compared to last year, and the City of Fairfax has seen its prices increased by about 8% from last year’s year-to-date figures. But normally, when prices are up, it’s because inventory is low. The good news is that there is plenty of inventory for buyers to choose from. 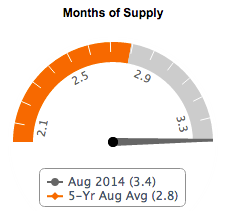 As of August of 2014, the months of supply is at 3.4 compared to the last 5 years’ average of 2.8. What this means is that we have a healthy real estate market with plenty of listings that are constantly being replenished. Because, let’s face it, 3.4 months of inventory isn’t exactly “high inventory”, so that means that listings are overall moving well. For buyers, right now is a great opportunity to find a nice home that meets their needs and, due to the time of year, it’s the best opportunity for negotiating the best terms possible. For sellers, this is a good time to sell a home too. If the home shows well and is priced appropriately, statistics show that it is likely that there will be a willing and able, interested buyer within the first couple of months. Also, average home prices are strong at $478k, compared to the last 5 years’ average of $444k. So yes, now is a great time to move (and then start planning next year’s vacation… hopefully on a cruise ship 😉 ). If you are interested in moving, contact us and we’ll be happy to provide you complimentary market statistics tailored specifically to your zip code.